The Samson Axis Typhoon board racks are some of the most versatile board racks on the market. Made for the Malibu Axis Wakeboard tower these swivel spinner racks mount to the 4 hole pattern of the Axis wakeboard tower. These are some of the best aftermarket Axis racks available. Also multiple Fork configurations give you the ability to have board racks that meet your riding. Wake/Surf/Wake, Wake/Surf, Wake/Wake and Double Surf allow you to configure your board racks on your boat just the way you want them. Wake/Surf - holds 1 wakeboard and one wakesurf board forks are 1-1/8" and 2-1/8"
Double Wakesurf - holds 2 wakesurf boards forks are 2-3/8"
Wake/Surf/Wake - holds 2 wakeboards and 1 wakesurf board forks are 1-1/4" and 2-1/8"
Knee-Board/Wakeboard - holds one knee-board and one wakeboard. This fork is available in the medium angle only. 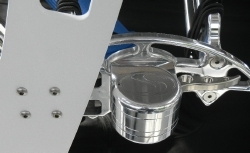 The fork gap measures 4" for the knee-board slot and the wakeboard slot gap measures 1-1/4". This product has not been reviewed yet. Be the first to Write A Review.